SIIG's USB 3.1 Type-C LAN hub with HDMI adapter - 4K ready expands a single USB Type-C port (with DisplayPort signal) from your notebook or laptop computer to multi-function outputs with Gigabit Ethernet, HDMI and USB ports. It adds a Gigabit Ethernet port to your computer to instantly utilize fast and reliable wired network connection. It also provides a USB hub with two ultra-fast 5 GB/s USB Type-A ports, enabling you to connect additional peripheral devices simultaneously. The built-in HDMI port allows you to connect your computer to a HDMI display or TV and supports Ultra HD 4K x 2K resolution to deliver stunning and crystal clear images/ videos. This plug-and-play multi-functional adapter is compact and lightweight to travel with; no external power adapter is needed. It is an excellent solution to help you expand your computer's connectivity to increase efficiency and productivity. 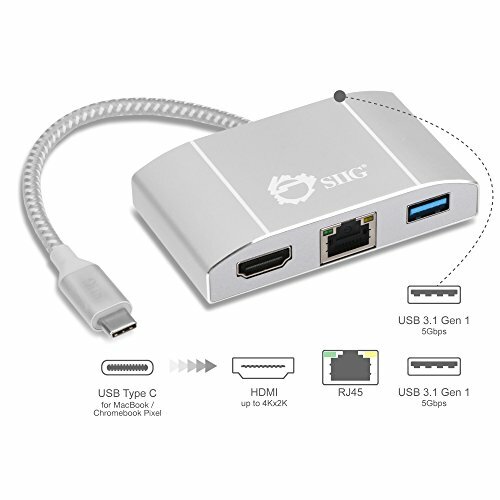 3 IN 1 SOLUTION: SIIG Type C USB/Thunderbolt 3 to Ethernet/HDMI/Type A USB 3.0 adapter hub instantly adds one HDMI port, one Gigabit Ethernet port and two USB 3.0 Type A ports through USB Type-C (DisplayPort signal enabled) connection to increase efficiency and productivity. Designed for newer systems equipped with USB-C (Type C) connector(s). RELIABLE WIRED GIGABIT ETHERNET(1000 Mbps) CONNECTION: Connects to the Internet faster and more reliably through gigabit Ethernet connection in Wi-Fi dead zones, streaming large video files, or downloading a software upgrade through a wired home or office LAN. Our USB C(Type C) to Ethernet adapter hub provides faster data transfers and better security than most wireless connections. High QUALITY VIDEO: Supports high resolution HDMI video/audio signal with maximum resolution up to Ultra HD 4Kx2K@30Hz. NOTE: "DisplayPort Alternate Mode" via USB-C is required for HDMI port to function properly. Not all USB-C systems support Alt Mode. Please contact your USB-C system manufacturer to confirm. QUALITY YOU CAN TRUST: Plug-n-play, no software required; Aluminium housing offers durability and excellent heat dissipation for long life and reliable performance. Pocket size with no external power adapter required provides greater portability. Our products are backed by SIIG's experienced tech support team and One year worry-free warranty.